I’m always on the run meeting lots of people with unique organizational challenges. Recently, we received a call from a sweet older couple that relocated from a small town in Ohio to Venice, FL. Their new home only had a master and guest bedroom and like a lot of people that downsize they lacked space. They put together a makeshift desk in the guest bedroom but there simply was not enough space to accommodate working in the room comfortably. This was further complicated by the fact that when their guests visited they wouldn’t have access to the room to do their day to day computer activities. They needed a solution and looked to Closet Tec for an answer. Like in all my consultations I asked a ton questions. After determining their home oﬃce requirements, I evaluated every nook and cranny in the home looking for an appropriate place for a combination desk, bookshelf and ﬁling cabinet. When I say every nook and cranny I mean “every nook and cranny” (we even examined the master closet to see if we could do something creative there). We ﬁnally came to the conclusion that the only appropriate place for the home oﬃce would be in the master bedroom. It meant that some furniture had to be rearranged and the unit had to be fairly small by Closet Tec standards but it was right for what they had to work with. After determining the location the next major decision revolved around doing a custom built-in solution versus a store bought piece of furniture. Despite the fact that Closet Tec manufactures custom cabinetry it was abundantly clear to me that this couple didn’t need a custom built solution. Their needs could be satisﬁed by going to a local furniture store and they could save money by doing so. After 90 minutes of consultation that’s what I recommended they do. Pushed real hard to sell a custom built solution. Walked out of the home not particularly happy that I had spent two hours of my time not being able to monetize. Nowadays when I walk out of these situations, I get a sense of joy that at least we were able to help. Out caring the competition is something we discussed at Closet Tec all the time. We stress it at every level of the business from manufacturing to installation. Although you certainly have to deliver the goods with your products I attribute much of Closet Tec’s success to simply caring. 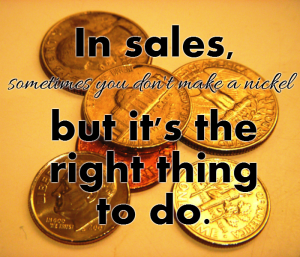 In sales sometimes you don’t make a nickel but it’s the right thing to do.